Preservation work on ancient and unique frescoes in the Cathedral of the Nativity of the Theotokos at the former Nativity of the Theotokos Monastery in Ferapontovo, Vologda Province, has been completed, ensuing that the spiritual treasures will be enjoyed for generations to come. The frescoes, dating to 1502, are the only ensemble of the great Russian master Dionysius the Wise (c. 1440-1502) that have survived to our day in their original form, according to the site of the Ministry of Culture of the Russian Federation. The ensemble was recognized as a UNESCO World Heritage Site in 2000. “The complex of Ferapontov Monastery is the purest and most complete example of an Orthodox monastic community from the 15th-17th centuries, a crucial period in the cultural and spiritual development of Russia,” states the UNESCO site. Initially, a 30-year cycle of emergency conservation was carried out on the frescoes, coming to an end in 2011, though experts then pointed to the need for constant monitoring of the condition of both the paintings themselves and the work already carried out. Thus, preservation work continued in 2012-2018 in the norther, western, southern, and eastern parts of the quadrangle of the cathedral, as well as in the northern altar apse and altar. In 2018, conservation continued in the central and southern apses. The Cathedral of the Nativity of the Theotokos is the center of the architectural ensemble of the Ferapontov Monastery. It was the first stone building of Belozerye and of the monastery, built, most likely by Rostov masters, in 1490 on the site where the monk Ferapont had consecrated a wooden church in 1408. For 400 years, the monastery was one of the most important and educational centers of the Russian north and has preserved the unique frescoes of Dionysius and his sons from the early 16th century. As the monastery gradually lost its religious importance, it became a place of exile for high-ranking clerics, including Patriarch Nikon. It was closed by Emperor Paul in 1798, reopened as a convent in 1904, and closed again by the Bolsheviks 20 years later. In 1975, it was turned into a museum and has been part of the Russian North National Park since 1991. According to UNESCO, the Russian Church does use two churches from the ensemble as parishes. Dionysius was acknowledged as the head of the Moscow school of iconography at the turn of the 15th-16th centuries. He is also known for a series of icons painted for the Dormition Cathedral in the Moscow Kremlin. St. Joseph of Volokolamsk was among his notable patrons, for whom he painted more than 80 icons. Church of the Nativity of the Mother of God, unusual with the double tower. Patriarch Nikon spent his time in Ferapontov in apartments here, at the entrance gate of the Monastery. These areas were not opened when i visited in the mid-1990s. I wonder whether they are today. 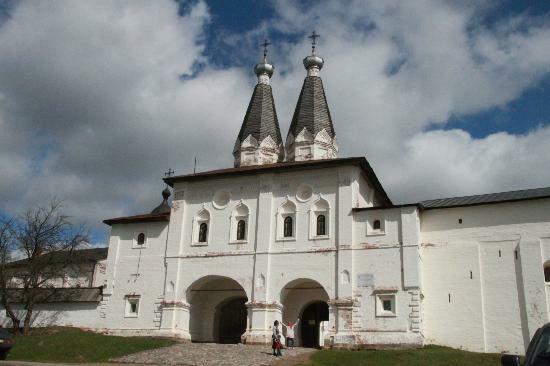 "Abbess Thaisia revived the famous Ferapontov Monastery, where the great Patriarch Nikon was unjustly imprisoned in the later 1660s before being transferred to neighboring Kirillov - the Kirillo-Belozersky Monastery. At least one other champion of the superiority of Church over state was exiled here as well. Due to the activity of this native of the Russian North, the famous frescoes by the painter Dionisy [ + c. 1520 ] -- the only ones still surviving anywhere in Russia -- were saved from destruction due to neglect. Today Ferapontov is "considered one of the purest examples of Russian medieval art, a reason given by UNESCO for its inscription on the World Heritage List. The monastery was founded by Saint Ferapont in 1398 in the inhospitable Russian North, to the east from the Kirillo-Belozersky Monastery, named after his fellow monk, Saint Kirill of Beloozero. The fame of the monastery started to spread under Kirill's disciple, Saint Martinian, who was to become a father superior of the Troitse-Sergiyeva Lavra in 1447. Even after Martinian's death, his monastery was protected and favoured by members of Ivan III's family. The most ancient structure, the Cathedral of Nativity of the Virgin (1490), was built in brick by the masters of Rostov. This edifice is the best preserved of three sister cathedrals erected in the 1490s in the Russian North. All the interior walls are covered with invaluable frescoes by the great medieval painter Dionisius. This is the last surviving Russian medieval church with fully painted walls." About Dionisy, about whom many have not heard have they not traveled to this area, he was " the outstanding representative of the Moscow icon painting school of the turn of the 15th and 16th centuries. The wall-painting consists of 300 compositions and occupies 600 sq m [eters] " in the Cathedral of the Nativity of the Mother of God at Ferapontov. 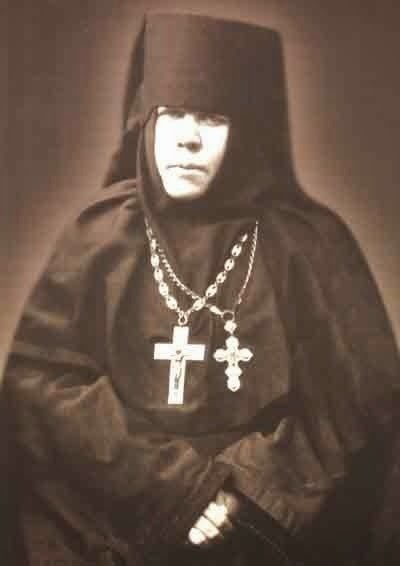 In 1904, Abbess Thaisia turned the former monastery of Ferapontov into a Convent which survived until the Bolshevik persecutions. These claimed the Abbess, Seraphima, and some of the nuns, locals of the area recall. Quick video [ if you turn off the musical accompaniment and Russian language interviews if not a Slavic languages speaker ] which transports one over to that absolutely magical place. This clip allows one to see the entire surrounding area of this important monastic institution -- hopefully soon to be returned to its original purpose.